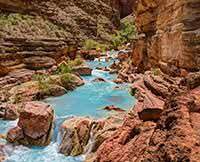 We took a 7-day river rafting trip on upper 2/3 of the Grand Canyon. Ben and Evan were the guides on our boat. They were both extremely knowledgeable about the geology, wildlife, and history of the canyon. Both were also very personable and witty. We had a great group of guests and a great time. Just wish the river wasn't so cold!